Rintarō discovers that a television in the electronics shop below the lab is the key to the time slot in which D-Mails can be sent. Kurisu then theorises that it might be possible to send memories back in time in the same manner as D-Mails, effectively allowing people to ‘leap’ to the past. 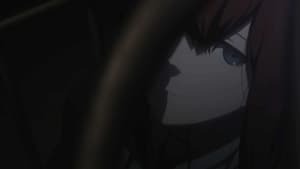 As Rintarō goes into town with Mayuri to look for parts Kurisu needs, running into Moeka along the way, Suzuha tells Rintarō that Kurisu works for SERN, though Kurisu denies this when asked. Kurisu tells Rintarō about the troubles she has with her father, who grew to hate her when she surpassed him in scientific prowess, though cheers up when Rintarō offers to help them reunite. As Mayuri and Kurisu decide to have a sleepover at the lab, Rintarō receives another sinister text message warning him that he knows too much, later learning that the lab is connected to the SERN network without the lab members’ knowing.